One of my favorite songs is “The Sound of Silence” by Simon & Garfunkel. Unfortunately, for a portion of the population, there’s no such thing as silence. They suffer from tinnitus, or ringing in the ears. And contrary to popular belief, tinnitus is NOT a disease. It is a symptom of other conditions that affect the ear. 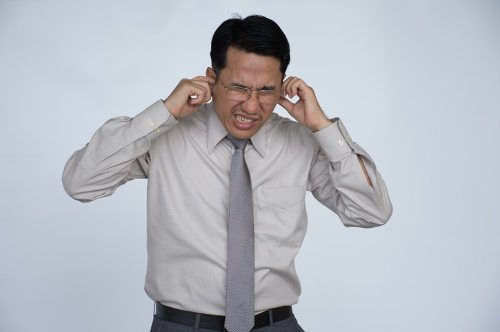 Though “ringing in the ears” is the common phrase used to describe tinnitus, it is not entirely accurate. The sounds actually vary from buzzing and swishing to ticking and other unique sounds. However, the one common thing about all these sounds is that they seem to originate from inside the ear, rather than from the outside. This condition can happen in one ear or both ears. Most of us will experience it at some point or other. According to the National Institute on Deafness and Other Communication Disorders (NIDCD), nearly 25 million Americans in the U.S. experienced tinnitus in the past year. Probably the most common cause for tinnitus is hearing loss. Other causes could be anemia, trauma, exposure to loud noises, overuse of certain drugs and medications, and other diseases like hyperthyroidism, Meniere’s disease, and certain tumors in the brain (acoustic neuroma). The sounds can be extremely irritating and frustrating to people who have it. So, it’s important to find the underlying cause and treat it accordingly. Your doctor might suggest hearing aids, wearable sound generators to mask the sounds you hear, acoustic neural stimulation, and even cochlear implants. But, there are certain lifestyle changes that you could try before resorting to these more expensive and sometimes cumbersome methods. Practice relaxation techniques like meditation, as stress triggers the sounds. Wear hearing protection devices while around loud noises (hair dryer, lawn mower). Turn on a fan, radio, or white noise when trying to sleep. Eat a healthy diet and exercise regularly (it helps flood our ears with healthy nutrients and oxygen). Try eating the stem of pineapple in cases of inflammation (the fruit contains the anti-inflammatory bromelain). While the above tips could help manage the condition, there is no real cure for tinnitus. The best thing for you to do is try and accept the sounds, and not get stressed by it. It’s also important to make your condition known to the people you interact with on a daily basis, to avoid simple communication issues and the stress that accompanies them. “Tinnitus,” PubMed Health; https://www.ncbi.nlm.nih.gov/pubmedhealth/PMHT0024989/, last accessed August 28, 2017. “Tinnitus,” National Institute on Deafness and Other Communication Disorders; https://www.nidcd.nih.gov/health/tinnitus, last accessed August 28, 2017. Marchione, V., “Natural Home Remedies for Tinnitus,” Bel Marra Health, August 17, 2016; http://www.belmarrahealth.com/natural-home-remedies-tinnitus/, last accessed August 28, 2017.